I have written about Ezra Meeker before. He’s something of a hero in my neck of the woods, or at least he was when I was a girl. So I was delighted recently to learn that he wasn’t the only exceptional person in the family. His wife Eliza Meeker deserves as much recognition. Eliza Jane Sumner Meeker was born in 1833. She and Ezra were childhood sweethearts in Indiana, their parents’ farms being located nearby. Where Ezra appears to have been the visionary, Eliza was the practical one. Ezra told her he wanted to be a farmer, and she agreed to marry him when she was only 18 so long as he agreed to own the land. That proved difficult for the young couple, who had little money. In less than a year, they decided to head west for Oregon Territory. A tiny woman just over four feet tall, she carefully prepared and packed their food for the trip. Unlike many on the Oregon trail, they never ran out, and nothing spoiled in their six-month journey. And Eliza started out the trip with an infant only 7 weeks old. Ezra was nothing if not mobile. 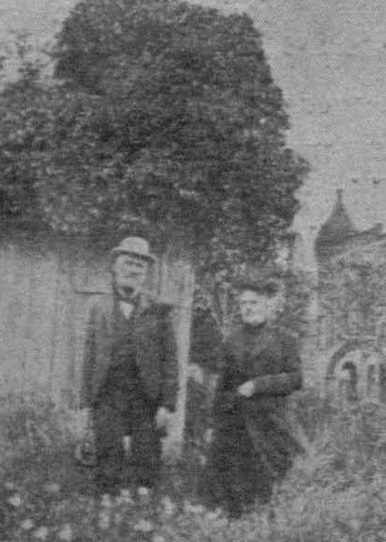 The couple settled first in St. Helens, Oregon, but staked their first claim across the Columbia River in what would become Kalama. But Ezra wanted more, better, and so they headed north, settling on McNeil Island across from the town of Steilacoom. Still not good enough. He sold their claim, which would eventually become the site of the McNeil Island Correctional Facility. He bought land in the south end of Tacoma, what is called the Fern Hill area today but went by the charming name of Swamp Place back then. Eliza managed the garden and orchard he put in. Still not enough. He had the brilliant idea of growing hops for beer, choosing a claim in the Puyallup Valley. And he made a fortune. That was enough for Eliza. She asked for half the proceeds of the sale of their last land claim and used the money to build herself and their six children a house, in her name. Not just any house. The Meeker Mansion, which still stands today, cost an astronomical $26,000 then and took 3 years to build. Eliza allowed an Italian painter to live with them for a year while he painted the murals on the ceilings. The house was wired for electricity long before Puyallup had any. Eliza even picked out and arranged for the furniture to be shipped, some all the way from Europe. The year the house was finished, in 1890, she donated their old cabin and land for a city park and served as the first “first lady” of Puyallup when Ezra became the first mayor. While Ezra was busy running things, Eliza championed the first Puyallup library and was an avid supporter of the suffragette movement. She even attended national meetings. Then a blight went through the hop fields, and they lost everything. Ezra decided to seek his fortune in the Yukon. Eliza had a better idea. She dried 30,000 pounds of vegetables, which Ezra took north to sell in Dawson City. To protect her beloved mansion from being sold to pay their debts, she sold it instead to her daughter Caroline and husband, with the provision that she and Ezra be allowed to reside in the house until their deaths. Eliza died in 1909, leaving behind a family and a legacy that would not be soon forgotten. Eliza sounds like an incredible woman! Women in the west were a lot more bold about asking for and getting what they wanted than their eastern sisters. Thanks for sharing this story. Thanks, QNPoohBear! I only wish I'd thought to check her story sooner!